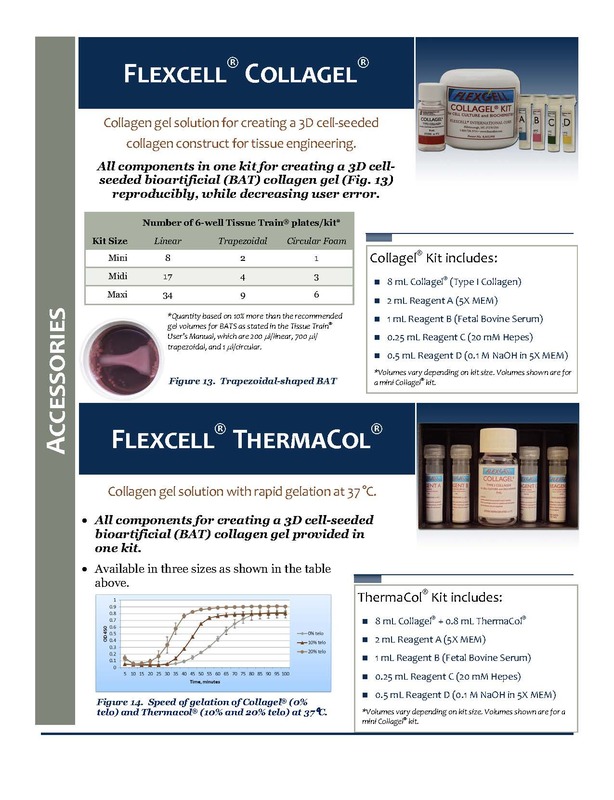 All components in one kit for creating a 3D cell-seeded bioartificial type I collagen gel. Reproducible formation of homogenous collagen gels. Multiple applications including tissue engineering, migration studies, differentiation, chemotaxis, cell interactions, & matrix interactions. Kit contains type I collagen, 5X MEM, fetal bovine serum, 1 M hepes, and 0.1 M NaOH. Available in three sizes: mini, midi*, and maxi*. 3D Cell Culture - culture cells in Collagel® to create a 3D cell-seeded type I collagen hydrogel. Tissue Engineering - use Collagel® with a Tissue Train® culture plate to create bioartificial tissues. Mechanical Load - culture cells in 3D then apply mechanical load with the FX-6000? Tension orCompression System. Drug Discovery - culturing cells in a 3D environment better mimics in vivo conditions and thus provides a platform to study the effects of various pharmacological agents on cells in a more natural environment. Collagen gel solution for tissue engineering. Kit contains type I collagen, 5X MEM, fetal bovine serum, 20 mM hepes, and 0.1 M NaOH. Available in three sizes: mini, midi, and maxi. Mechanical Load - culture cells in 3D then apply mechanical load with the Flexcell® Tension orCompression System.